This LP has 229 parts. 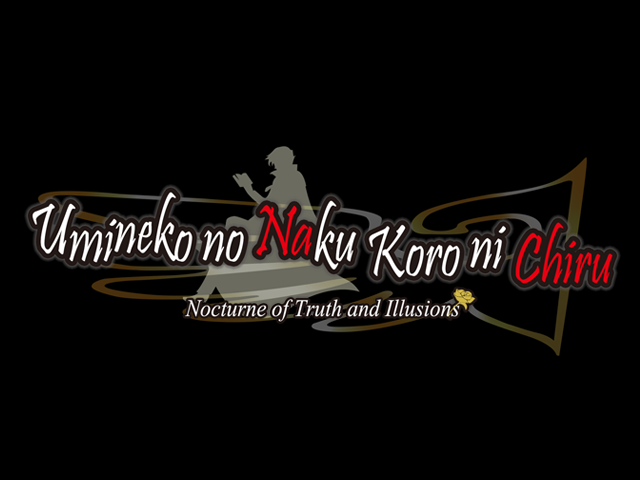 Umineko no Naku Koro ni Chiru is the 2009 sequel to Umineko, and the second half of the story. The first four episodes introduced the central mystery of the identity of the Golden Witch, Beatrice, and the search for the truth of what happened on Rokkenjima. In the episodes to come, all will be revealed at last. Maybe. Chiru is not yet available on Steam, so I'll be using a fan-translation this time. When it comes out, I urge you all to shove your wallets all over it immediately. If you haven't read the previous LP, none of this will make any sense for you. Go do that right away, it's a wild ride. Screenshot LP, music and video links throughout. These links will be optional, but the music is even better this time than it was in the first game, and the voice acting is stellar. Updates will be guaranteed every Monday, Wednesday and Friday. Whenever my backlog of prepared updates is 10 or more posts long, I'll kick it up to a daily schedule. Any breaks from this pattern will be announced in advance if possible. Unlike with the previous thread, the videos and posts will finally be using the same translation. Three cheers for consistency! If you really want to see a video for a specific scene, request it in the thread. If there's enough interest, I'll edit the post to add it. Why is everything so low-res now? Episodes 2-4 in the last thread used the Umineko Project release. Sadly, that version of the game doesn't cover Chiru, so we're back to PC version resolution. What's with all the weirdly-formatted text? Umineko makes heavy use of significant, colored text. SA doesn't allow colored text in posts, so I am forced to improvise. Red text is represented with bold courier, and blue text is represented with italics courier. None. Not even the slightest small spoilers are permitted. Don't talk about events or characters that have not yet appeared in the story. Do not say "this scene is so important in hindsight" or "I can't wait to see the thread react to the impending big twist" or anything of the sort. Do not post spoilers disguised as speculation. Umineko is, on several levels, a whodunit murder mystery, so speculation and theorycrafting are most of the fun. Don't ruin that. But I have a burning need to discuss spoilers! Luckily for you, we have an open-spoiler Discord chat, for veteran witches to come in and discuss the game and laugh as the thread newbies stumble just inches short of uncovering the truth again and again. Do not join unless you have already experienced the entire game, start to finish. I'm going to post something that looks innocuous, but in hindsight will turn out to have been a clever secret spoiler! These are fine, but black bar them. Special thanks to poorweather for helping out with identifying music links during episode 8.